Sweet Home 3D Forum - View Thread - Light & textures - rendering examples of this and that. Thread: Light & textures - rendering examples of this and that. 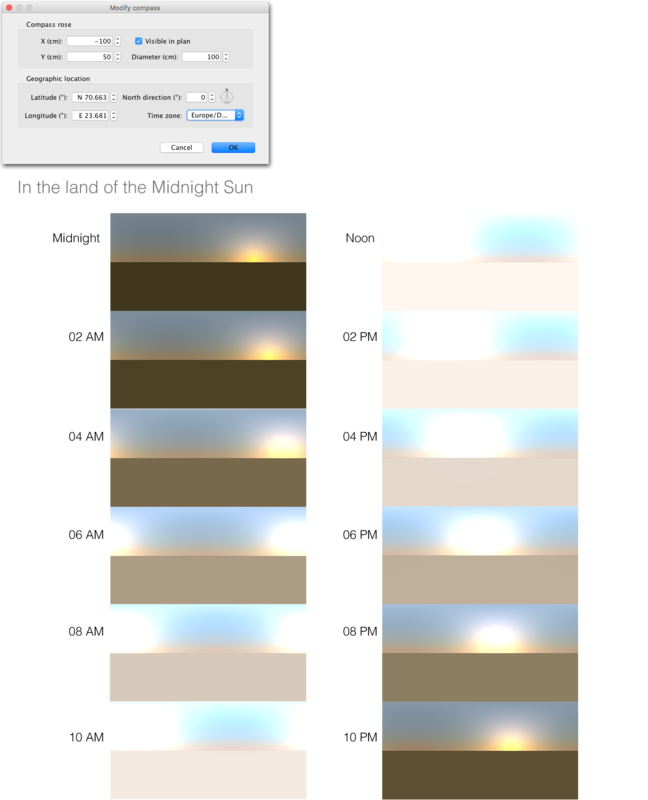 Re: Light & textures - rendering examples of this and that. btw: You should revise your spellcheck settings and untick the automatic replacement ( or what it’s called). Here are my two colour palettes — cold and warm. This is a 24 hr sequence of the midnight sun with the coordinates from Hammerfest in Norway, the first urban settlement in Northern Europe to get electrical street lights. My intention was to continue an earlier experiment where I quite unsuccessfully tried to create the illusion of a slightly visible light bulb inside a lamp shade. I was thinking that Enkonyito's new opaque light sphere would be perfect for achieving the effect I was after. plus a lot more that made it interesting to work with. I just needed to perform some minor modifications for the project to suit my purpose. First I changed the texture of the red lamp shades to a 95% opaque red fabric texture. image of the opaque sphere light that had now become visible thru the barely transparent lamp shade. I did this for both the red lamps in the room. The result was okay, although not as perfect as I had hoped for. and some outside the windows). The rest was left untouched (I think). The modified project file (28 Mb) is HERE for anyone interested in seeing what I have done. Afterwards I added some surroundings and played around with some other stuff, to see if I could create an exterior snapshot. Sweet Home Hotel magnified! Many thanks, Cecilia! I counted more than 20 new light sources, and you did not just sprinkle them "here and there". I think your "minor modifications" are well worth a study for anyone interested in advanced lighting. I would have liked to see the project file for your second image as well. Cool! Thank you for this. Angelo Badalamenti was totally unknown to me – a new favourite. I was only eleven when Twin Peaks was the talk of the town. It was not my cup of tea – back then. I often find myself listening to music when I'm working. Well, it's forever lost. I didn't think of saving it. I really wish more people would share their project files. Some of the renderings I have seen here lately are way better than mine. since some of you are still reading this thread (and I'm also getting e-mails about it) I need to point out that some of the earlier posts here are posted prior to the release of SH3D version 6, meaning that some of the info and statements are no longer valid. So please don't mail me about errors. I'd rather you posted your comments here, so that your info and suggestions are shared. Thank you all for reading this thread and for sharing your thoughts.